I know it's been a while since I posted and that's because I have a new job. Woo! Job! Now down to business. I want to talk about a singer called Jena Lee. Jena Lee(Sylvia Garcia) was originally born in Chile on June 29th of 1987. She was adopted into a french family at the age of 9 months and moved to France with them. Jena loved music and I mean LOVE music. She recorded her first songs on a tape recorder when she was young. Jena soon met Sulee B.Wax who was interested in her work and wanted her to write songs for the 4th season of her show "pop stars". Jena ended up writing 6 songs for the show. 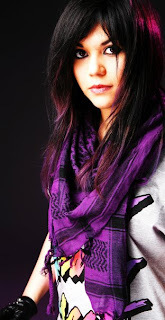 Jena Lee created her own genre known as "Emo RnB" which consists of guitar rifts and RnB music. Now while Jena likes the Emo/Hiphop style I believe the more deeper meaning to her using the term Emo is because of how emotional her songs can be. Now when I first heard Jena Lee, it was because a friend showed me her and told me I may like the animations which I did but more importanlty I loved the lyrics and I love the way the French lyrics flowed with the melody. When I listened to "J'aimerais Tellement" (I would like to so much) and with the visual of the video I felt as if I had imersed myself into her songs and was living "Jena's world". I then listened to "Je Me Perds" (I am lost) I felt yet again that this artist got me and what I was going through. Though I've ran into a few French people that didn't seem like her personally, they seemed amazed that I did. I have to say that Jena Lee's back story and her music is a great couple. I'm hoping to hear more from Jena Lee and I hope to some day work with her, if that ever happens. Now I'm sometimes not too found of the bands she features with just because I don't think they sound like they fit in with the "Emo RnB" scene but after listening to a couple I've come to accept and like it. I think Jena though sounds a bit better or maybe feature with another girl. What about Jena now you asked after googled? Well Jena Lee has a new band called Dirty Diary which is combined with a band from Los Angelos and Paris. The band created their first demo "Wonderland" which seems to be sung in English and French, or maybe just english. It's very good, and a bit more happier than Jena's normal thing but then again this is a band . What is Dirty Diary? Who's in Dirty Diary? Remember when I mentioned Jena should do vocals with another girl, well not too long ago I just found out she is! Dirty Diary consist of 2 girls. Gia and of course Jena Lee. Now I'm not certain on how the 2 met considering Gia Martintelli is supposibly from California and Jena Lee in France but I'm hoping that clears up and I understand more. Though the band doesn't seem to have much activity and I can understand because it takes time to form bands and to really get in the groove as a band but after hearing the Demo of "Wonderland" I yearn for more. In conclusion, I give Jena Lee 5 out of 5. She's unique, french, and likes doing her own thing. The lyrics are truly a masterpiece and she seems to be trying to get the most out of her music career. My favorite Jena Lee songs are listed below. Keep up the good posts! Maybe cover LM.C if you haven't already? And let's us know about that silly little . in their name?